In February, the New York Times announced that a project designed to revolutionize our understanding of the human brain was in the works. 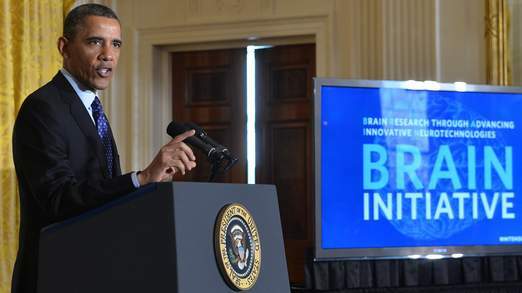 Today, US President Barack Obama has confirmed that the Congress will spend $100m on a new research initiative Brain Research through Advancing Innovative Neurotechnologies (BRAIN). the BRAIN (Brain Research through Advancing Innovative Neurotechnologies) Initiative ultimately aims to help researchers find new ways to treat, cure, and even prevent brain disorders, such as Alzheimer’s disease, epilepsy, and traumatic brain injury. The BRAIN Initiative will accelerate the development and application of new technologies that will enable researchers to produce dynamic pictures of the brain that show how individual brain cells and complex neural circuits interact at the speed of thought. These technologies will open new doors to explore how the brain records, processes, uses, stores, and retrieves vast quantities of information, and shed light on the complex links between brain function and behavior. Europe has also been actively pursuing a similar dream, investing invest 1 billion euros in the Human Brain Project, which plans to integrate the vast amount of brain research and data to build computer models and brain simulations. See video below.